With a new little baby taking a lot of my time these days, I am constantly looking for simple ways that I can connect with my older kids and give them some attention. This activity didn't take very long, but combined several of my 4 year old's favorite things- his name, fizzle painting, and turkey pumpkins! Materials Needed: paint, paintbrush, baking soda, vinegar, pumpkins, colored cardstock, scissors, pencil, pen, glue, and googly eyes. 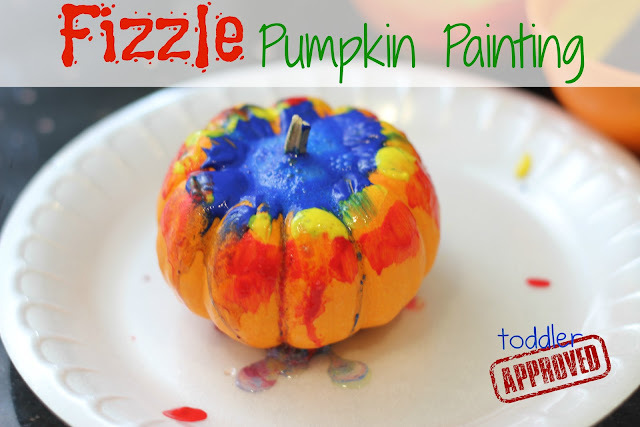 Start off with some fizzle pumpkin painting. You can find the instructions here. After some fizzle painting, let your pumpkins dry while you cut out turkey feathers and turkey faces from cardstock. Have your child write a letter of his name on each feather and then glue them to the dry pumpkin. My son wrote the letters with pencil and then I outlined them with a black Sharpie to make them pop. Next have your child glue the turkey face, eyes, and beak onto the pumpkin stem. My son added a play-dough gobbler as well. Once your turkey pumpkin is dry you can display it! My son loves any activity that includes his name, so this was right up his alley. This could also be used to decorate your kid's Thanksgiving table. 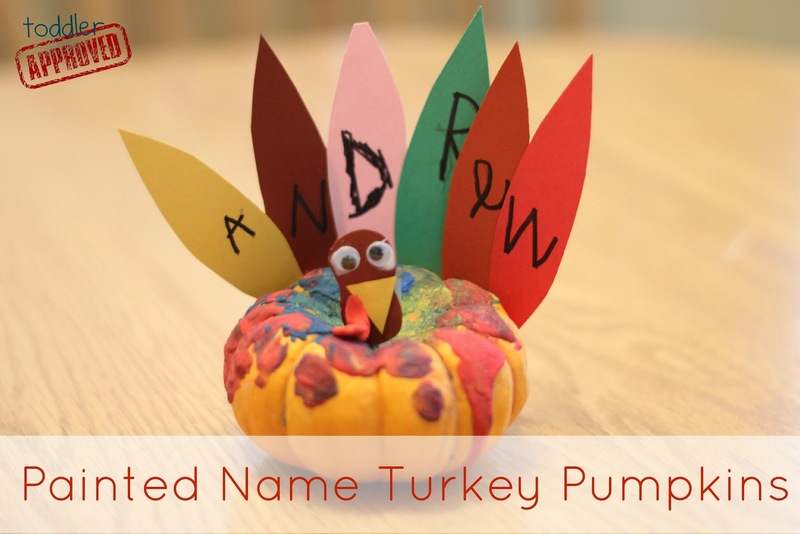 Don't you think fizzle name pumpkins could be fun place cards or centerpieces? What other simple Thanksgiving activities do you like to do at your house? By the way, Have you entered our Scratch Art Light Box Melissa and Doug giveaway yet? Only three more days! Very cute. Makes learning fun. Pinning this. I was trying to think of something to do with our little pumpkins. This is perfect! 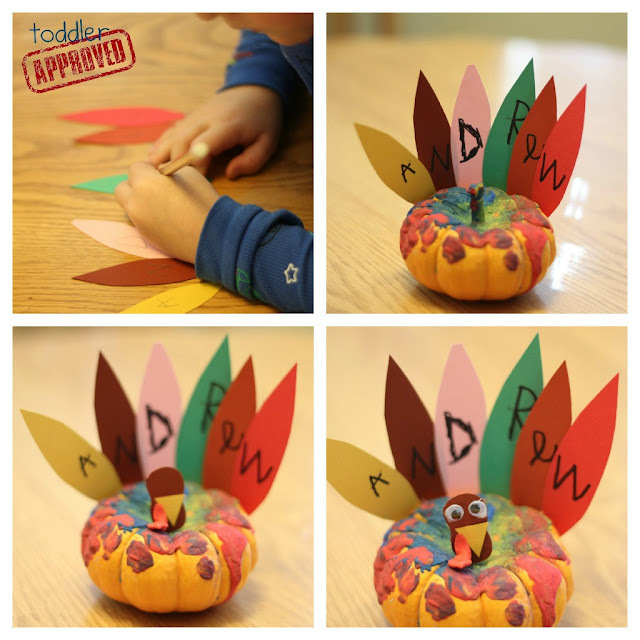 Looking for thanksgiving crafts and discovered yours on interest! So creative and clever. Such great ideas with those mini pumpkins! Love them! We have a little pumpkin like this from Halloween. I think we might have to make this as our centerpiece/decor for turkey day!! Thanks Cassi!!! I love the Crafty Crow! !